I used flat bean (sim) in this recipe. 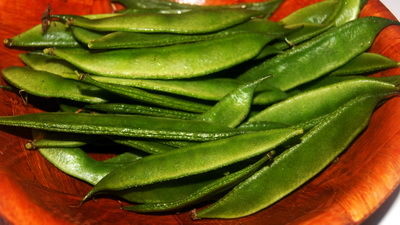 If you want, you can use snow peas instead of flat bean kind of same taste. 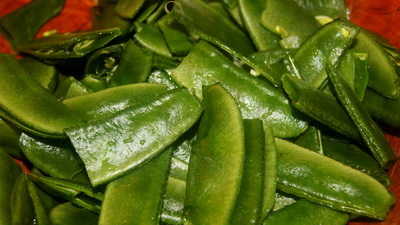 But snow peas need less time to cook, so add it when potato is half done. 1. Cut the bean in middle and wash it. Keep aside. 2. Wash and cut each tomato into 8 pieces. Keep aside. 3. Peel the potato and cut into .30˝ thick. Wash it and keep aside. 4. Clean the fish and wash it. 5. Mix turmeric and salt with fish. 6. Heat the pan with oil and fry the fish 2 minutes each side. 7. Remove fish from oil and in the same pan add sliced onion. 8. Fry it till it becomes soft and transparent. Add onion paste, turmeric, chilli, bay leaf and salt. 9. Cook it till oil is separated and add potato. Cook it 2-3 minutes and bean, fish and 3 cups hot water. 10. Cook it under closed lid about 6 minutes and add tomato. 11. 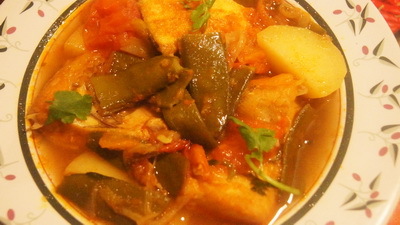 Cook it till potato is tender and add coriander leaves or roasted cumin. Remove the pan from heat. 12. Serve Ruhi with Flat Bean /Rui Macher Sim Curry with plain rice. This recipes is great. I have tried this at home with great taste. Vege+fish = healthiest thing in the world. Thanks rownak. Thank you so much for your hard work and helping people like me, how to cook. It’s really good Bangla recipe web site. I tried couple of your recipes and it’s turned out quite well. Thanks to you. Anyway I was reading your Ruhi with Flat Bean /Rui Macher Sim Curry recipe and I am not sure when do i need to add roasted cumin powder. Appreciate you help in this matter. Take care & all the best. Thanks for appreciation.Normally I use either roasted cumin or coriander leaves.I dont use coriander leaves and roasted cumin together. Roasted cumin will go in the end like coriander leaves.